In this article we will show you how to link aadhaar with Central bank of India saving account online without visiting branch. As per the Govt. of India mandate (under Prevention of Money Laundering Rules, 2005), all Bank Accounts / loan accounts must be linked with Aadhaar before March 31, 2018. Customers of Central Bank of India can easily link aadhaar with their bank account online, even without net banking or mobile banking. Follow this online process and link your aadhaar within 2 minutes. You don’t need net banking or mobile banking facility. CBI has launched online portal to avail this facility. 2: In next screen, type your 10-digit account number, 12-digit aadhaar number and registered mobile number. Check on “I Agree” and submit. 3: In next page, you need to enter OTP (One Time Password) which received on registered mobile number. Enter OTP and submit. 4: Done! your aadhaar seeding request submitted successfully. Within 15 days your request will be completed and you can check online whether account linked with aadhaar or not. 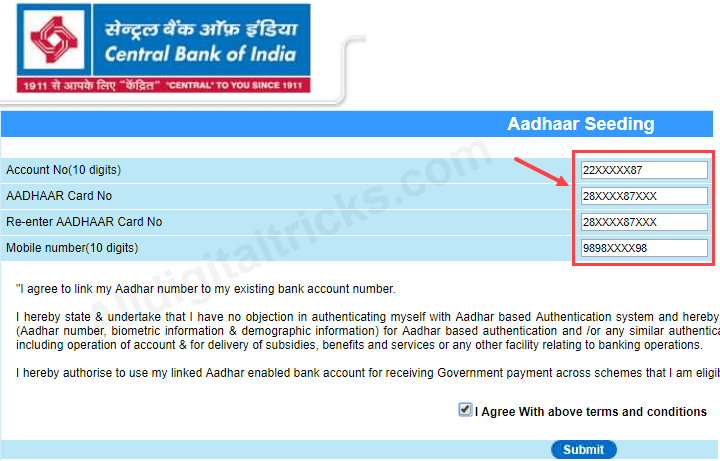 You can also use Central Bank of India net banking facility to link aadhaar with your account. Now click on Aadhaar Registration — Aadhaar-Bank Account-Link. Enter your CIF number which you can find on passbook, 12-digit aadhaar number and click on submit. So by following these two online methods you can link aadhaar with Central Bank of India account. You can also visit your branch and submit aadhaar copy.